The Secretary for Financial Services and the Treasury, Professor K C Chan, on behalf of the Government of the Hong Kong Special Administrative Region, signed in Hong Kong today (January 16) a comprehensive agreement for the avoidance of double taxation (CDTA) with Belarus, which signifies the Government's sustained efforts in expanding Hong Kong's CDTA network, in particular with economies along the Belt and Road. The Belarusian Minister of Taxes and Duties, Mr Sergei Nalivaiko, signed the agreement on behalf of his Government. 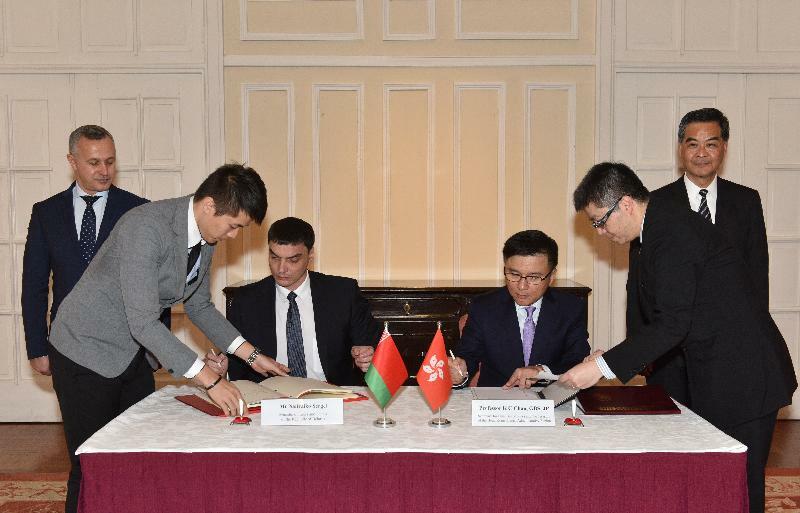 The Chief Executive, Mr C Y Leung, and the Belarusian First Deputy Prime Minister, Mr Vasily Matyushevsky, were present to witness the signing. The CDTA sets out clearly the allocation of taxing rights between the two jurisdictions and will help investors better assess their potential tax liabilities from cross-border economic activities. Professor Chan said, "This is the 36th CDTA that Hong Kong has signed with its trading partners. With the CDTA coming into force after the completion of ratification procedures on both sides, I have every confidence that the economic and trade connections between the two places will be bolstered." In the absence of a CDTA, the profits of Hong Kong companies doing business through a permanent establishment in Belarus may be taxed in both places if the income is Hong Kong sourced. For Belarusian companies, the income they earned in Hong Kong is subject to both Hong Kong and Belarusian tax. Under the agreement, double taxation will be avoided in that any Belarusian tax paid by Hong Kong companies will be allowed as a credit against the tax payable in Hong Kong on the same profits, subject to the provisions of the tax laws of Hong Kong. Likewise, for Belarusian companies, the tax they paid in Hong Kong will be allowed as a credit against the tax payable on the same income in Belarus. (c) Profits from international shipping transport earned by Hong Kong residents that arise in Belarus, which are currently subject to tax there, will no longer be taxed in Belarus. The Hong Kong/Belarus CDTA has also incorporated an article on exchange of information, which enables Hong Kong to fulfil its international obligations on enhancing tax transparency and combating tax evasion. The CDTA will come into force after the completion of ratification procedures on both sides. In the case of Hong Kong, the CDTA is implemented by way of an order to be made by the Chief Executive in Council under the Inland Revenue Ordinance. The order is subject to negative vetting by the Legislative Council. 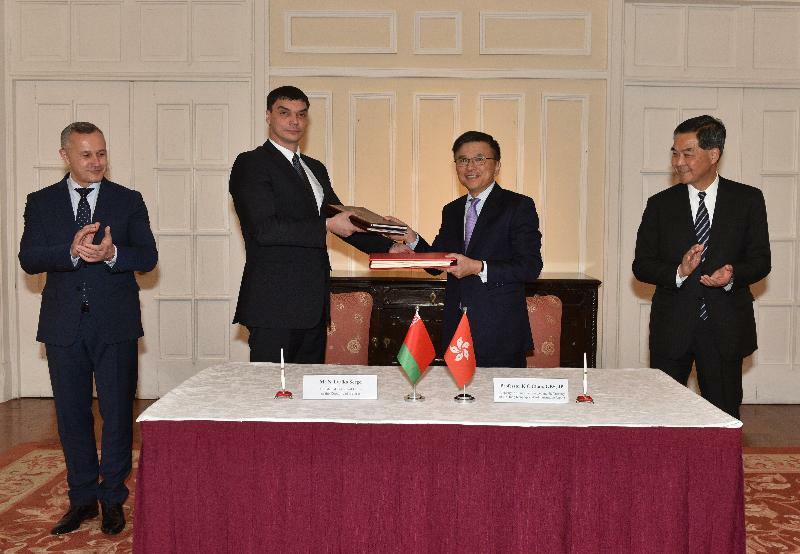 Details of the Hong Kong/Belarus CDTA can be found on the Inland Revenue Department's website (www.ird.gov.hk/eng/pdf/Agreement_Belarus_HongKong.pdf).